Holy Basil has been used for thousands of years in the traditional medicinal of India, Ayurveda. 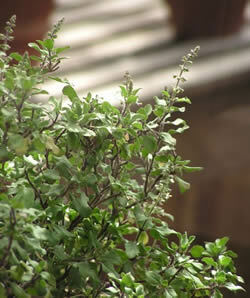 Known to Hindus as Tulsi the plant is also used in religious ceremonies. Holy Basil is used in Ayurvedic medicine for common colds, headaches, stomach disorders, inflammation, heart disease, various forms of poisoning, and malaria. Preparation Methods & Dosage :Teas, dried powder, fresh leaf, or mixed with ghee. Holy Basil essential oil is used in skin preparations and cosmetics. The holy basil plant looks very similar to other basils, with slender leaves, hairy purplish stems, and purple flower bracts. 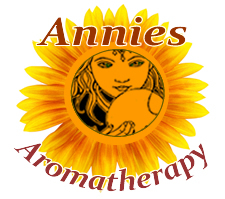 The leaves and the essential oil have a light musky scent with a warming hint of mint and cloves. It has a refreshing, pleasant smell, so keeping a plant in your home can purify the air. Bush basil, perennial in frost free zones, or can be over-wintered indoors or grown as an annual. Does best in full sun and can be grown in pots. Hindus believe holy basil is pervaded by the essence of Vishnu and his wife Lakshmi, and is itself worshipped daily as a deity. The plant is considered especially a woman's deity, as an embodiment of Lakshmi, or of Rama's wife Sita, or of Krishna's wife Rukmini. Women worship it with offerings of rice and flowers.Sir James George Frazer The Golden Bough. A Study in Magic and Religion. II. Part 1 (1890). Usha Lad & Dr. Vasant Lad. 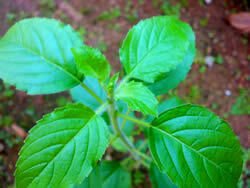 "Ayurvedic Cooking for Self Healing" The Ayurvedic Press, (2006) Tulsi is good for fever, cough, and breathlessness.